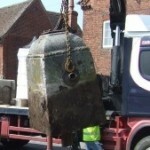 Lichfield District Council has set about restoring an historic drinking fountain in the city. Lichfield District Council is using funding secured from city developers to clean and restore the Serjeantson Fountain on Greenhill in Lichfield. 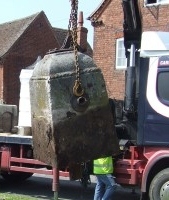 Contractors dug out the fountain and pump stone on Wednesday 23 May, and took them away so they could receive the conservation treatment. The work is planned to be completed by the end of June, with the fountain back in place in time for the Olympic Torch Relay on 30 June. When it is set back in place, passers-by may notice the fountain has changed in more than just its appearance. This is because, when it was excavated, the contractors discovered that it was buried at least 75cm underground – when reinstalled, it should stand considerably taller. Drinking Water Fountains feel that projects such as this one are vital – they not only ensure that the public in cities such as Lichfield have access to essential drinking water in the hot weather, but they also enable communities to restore a beautiful piece of its history.